This is a pencil sketch of the Blackbird War Room model. 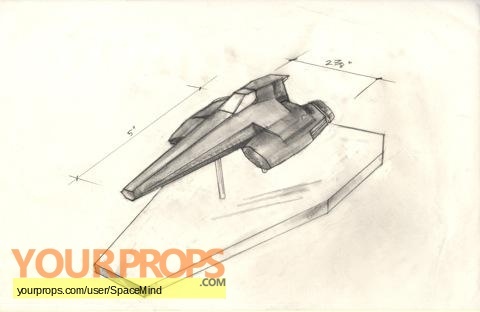 The sketch shows dimensions and shows the Blackbird on the lucite stand it was displayed on. The model was created for "Resurrection Ship" in Season 2. Pencil on 11" x 17" vellum. view all 92 items of "SpaceMind"
** The content of this listing is the sole responsibility of SpaceMind. Yourprops.com, its owners, agents and assigns assume no liability.